Enterprises are adopting both private and hybrid cloud computing models to meet the challenges of their business-critical workloads. 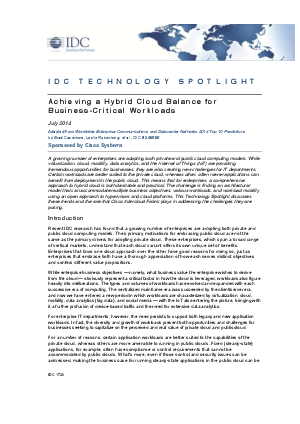 Read about these trends and find out how to balance these cloud models in this IDC Technology Spotlight white paper. Also learn about the role Cisco Intercloud Fabric plays in addressing these challenges.